Posted by Jonny Greenwood on 11/30/2018 2:15:26 PM. If you are both a Mac user and an eBook fan, you might feel like experienced a roller coaster. The Apple’s WWDC 2013 announcement of iBooks coming to the Mac with OS X 10.9 Mavericks brought a breath of fresh air, but quickly destroyed by the application itself. The capabilities of iBooks for Mac app is under Apple's average level, 8 out of 10 threads discussing iBooks for Mac app are full of complaints. Therefore we are facing this problem: We need another app for reading on Mac to replace iBooks for Mac, that is to say, we need an iBooks for Mac alternative. 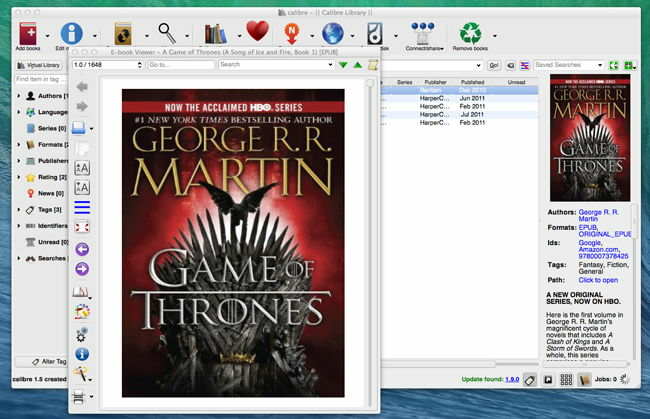 When we talk about eBook software, Calibre always comes at first, and this time will be no exception. Every coin has two sides, with so many recommendations and applauses, it is also the symbol of capable but ugly, not user-friendly softwares. No matter you like it or not, the truth that Calibre is the ONLY software which could completely replace iBooks for Mac cannot be denied. Its magnificant features of eBooks management, eBook sync, eBook edit and eBook conversion are all great, even greater than iTunes. But Mac users have a sense of beauty, if you are looking for an app to read an eBook gracefully, Calibre is out of your list. This is a must-have app if you are reading EPUB and PDF books protected by Adobe DRM, to know that over 2/3 popular eBook retailers are using Adobe DRM protection, then you would understand the must-have better. 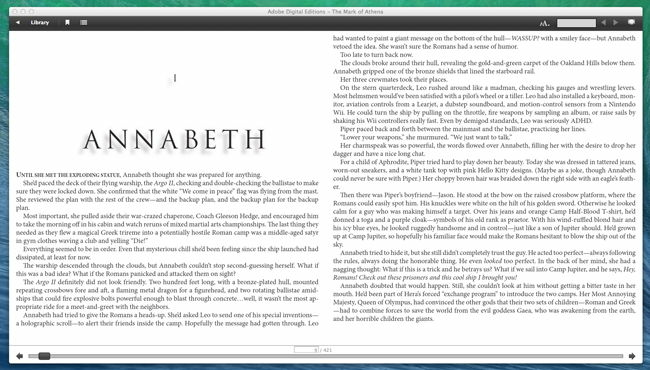 The UI design of Adobe Digital Editions is simple while keeps all the necessary features of an eBook reader app. What's more it enables people to manage the library in basic ways and even syncs eBooks between the devices which support Adobe DRM protected EPUB and PDF files. However, as long as you have Adobe DRM protected books, this app is the one you have to use. This is a light app developed by canoe software, it is an easy-to-use eBook reader app which supports eBooks management base on library shelf, and reads eBook formats as DRM-free PDF, EPUB, CHM and Mobi. As an eBook Reader, it enables people to make annotations, insert bookmarks and search works for definitions. And the support for both EPUB and Mobi attracts many users as many apps only suppot EPUB and PDF. Considering the Mobi stands for Kindle books, that is a big advantage. And ther is one thing we need to pay attention, if we directly drag an eBook file into the app's interface, nothing is gonna happen. It requires us to drag the entire folder into the app, and the flaw is it won't filter those non-eBook files, which is not user-friendly enough. 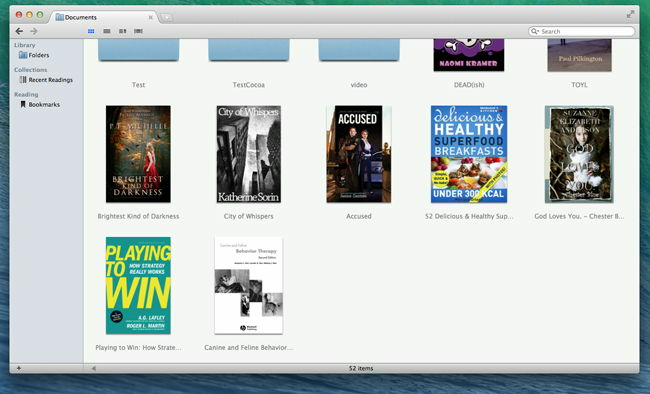 All in all, it is an elegant, tiny but handy app for reading variours formats of eBooks on Mac. And just inform that in my test, this app crashed a lot under Mac OS X 10.9 Mavericks. Price: $9.99 from AppStore, free trial is available on the official site. This is the last app I recommend in this post, and the reason why I put it in the last place is simple, it is inferior than the apps above. The biggest advantage of this app is free, but Adobe Digital Editions is also free while ADE is more stable and supports Adobe DRMed EPUB and PDF books. In the aspect of capability, it supports fewer formats than ClearView, and the UI design is also not delicate enough, makes people feel like it just adopts everything native in Mac's developer library. At the first time I run this app, I can't even get noticed it is ready to work. On the whole, if you want a free, light (2MB) and stable (crashes rarely under Mavericks) app to read DRM-free EPUB, you can choose kitabu. Tip: If your original file is Mobi but want to use Adobe Digital Editions or Kitabu, you can convert online for free, and vice versa.